Preparing for a long distance through hike (possibly your first) can be stressful. Relax! It is important to remind yourself that this is all just going to be, literally, a walk in the park. View from The Muir Hut atop Muir Pass in King's Canyon National Park, roughly half way through the John Muir Trail. 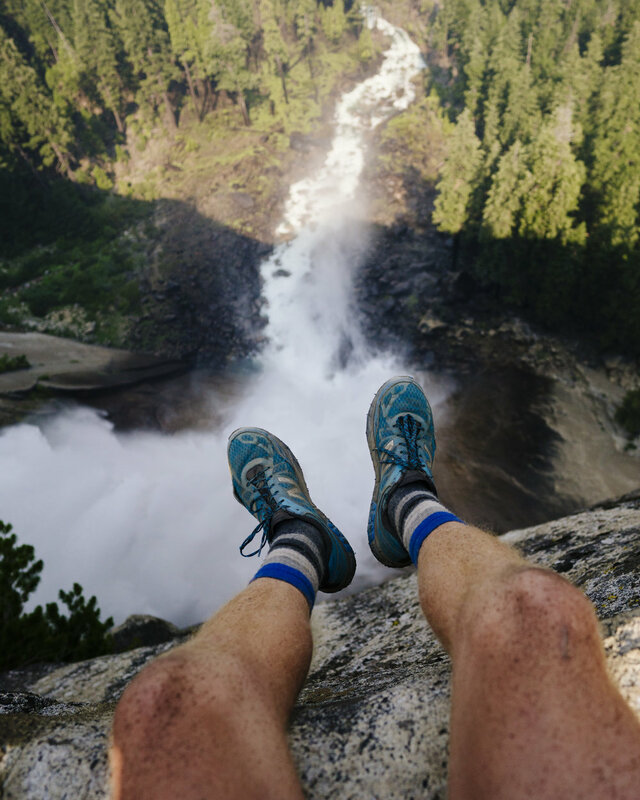 When I first started to prepare my pack for the John Muir Trail, I was nervous. All the gear I will need for 214 miles of hiking through snowfields, rain, and scorching heat? Planning ahead weeks worth of food? All while trying to keep the weight of your pack down? It can seem intimidating, but once you start to simplify the task at hand, focus on the essentials, and embrace your inner minimalist, packing for a through hike can be as rewarding as the hike itself… almost. And what a walk in the park it will be. On a personal note, hiking the John Muir Trail is hands down the greatest experiences of my life to date. The JMT connects the hallowed granite halls of Yosemite Valley with the tallest peak in the continental United States by way of some of the most serene natural beauty one can witness. Each day you spend on the trail is a day you go not only deeper into the Sierras, but deeper into yourself. There is something about being in the backcountry, isolated for days on end, that you just cannot experience on your average afternoon hike. I, like anyone who has done the JMT, will look fondly back on my summer in the Sierras for years to come. Full disclosure, for my trip on the JMT last summer I over packed. Horribly overpacked. When I told people how much my pack weighed they didn't know whether to think I was brave or dumb. I certainly learned the hard way how important it is to plan ahead and keep your weight down. As a rule of thumb your pack should never be more than one third of your body weight, and with a little effort it should be very easy for anyone to get their pack bellow 35-40lbs. Put in the extra time (and likely, yes, money) to get your pack feeling as light as possible and you will thank yourself every step of the way. Here is the advice I have for packing for the John Muir Trail. "Big Red," my way too big pack. Your Pack. Don’t over do it here. It just needs to be big enough. Not big, big enough. I went with a large, burly external frame pack. It fit everything, had pockets to make gear accessible, and supported the (massive) weight I was caring. The downside is that it was almost too big, and gave me the freedom to overpack. If you challenge yourself to us a smaller pack, you won't be able to overfill it and be burdened by unnecessary weight. The most important thing is not what your pack can fit, it is that your pack fits you. I recommend buying your pack in store so you can try it on, keeping the receipt, and putting some gear in it to take it out for a test drive. You won’t know how it feels to hike with your heavy pack until you do it. So plan ahead and make time for this, you will be glad you field tested your pack and down the line will be extra glad you got in some valuable training miles in. Your Shoes. - It’s not all about weight. Your footwear will certainly be the thing you bring that you will interact with the most.The right pair of shoes can make your experience a lot more enjoyable. Your shoes are you best friend. Personally, I went with a nice pair of trail running shoes. This decision was based on wanting my feet to be as comfortable as possible, which on long hikes often means keeping them as dry as possible. Even if your feet get wet (which they inevitably will, regardless of the footwear your choose) I found that, on a sunny day, my completely soaked running shoes would be more or less dry in less than 20 minutes of hiking. Whatever shoe or boot you choose, be sure to break them in before hand and learn your potential “hot spots” to help avoid blisters on the hike. Your Clothes. - I suggest finding a ideal hiking outfit and planning on wearing every day. Keep it simple, go for comfortable, quick drying base layers and lightweight, functional layers to add on in case of weather. Don’t bother bringing changes of clothes so you don’t smell too bad. You’re going to smell, regardless. Embrace it, own it. You are a through hiker, make your BO your badge of honor. Your Power. - I hiked with my BioLite SolarPanel 5+ strapped to the outside of my bag to gather sun during the day so I could charge my batteries of my phone and camera at night. I heard a lot of complaining about malfunctioning solar panels on your hike, but my BioLite panel performed like a champ. The simple system worked perfectly, and allowed me to make a few friends (and trade for a few snacks) because I was always able to offer fellow hikers a little charge. The food was, for me, the most stressful part of preparing for this trip. What if I don't bring enough food to eat? This part is all about knowing yourself, your needs, and packing as much nutrition as possible with as little space and weight as possible. This is about 6 days of food. Breakfast, Lunch, and Dinner. Breakfast: I find that I function best on a lighter breakfast packed with energy. Hot oatmeal with flaxseed, granola and peanut butter was plenty of fuel for me to get my day going, and a simple, fast way to get some warm food on cold mornings. I prepackaged my own portions for each day so I knew I was going to have enough to last, and enough to get me through the day. Lunch: The basic system that worked for me was a two part lunch. Something to keep me going, and something to keep me happy. I would usually give myself 1 or 2 protein bars to snack on so I knew I was getting the nutrition I needed, and a bag of trail mix, gummy bears, or even a PB and J to keep my sugars up and ease my appetite. Never underestimate the value of a little comfort food on the trail. Dinner: This is where you treat yourself, and lots of people put in hours preparing meals for these hikes so they can have their favorite, energy giving meals to fuel them through the hike. Being the inexperienced and uninformed chef that I am, I went with the pre-made backpacker’s meals you can get at any adventure outfitter. They are moderately priced and made for hungry hikers so you know you will get plenty of nutrition. The downside of them is that they can be a bit, lets say underwhelming in the flavor department. I suggest bringing a little extra seasoning or hot sauce if you can. Trail through Lyell Canyon on the edge of Yosemite National Park. Water Filtration: You will find this is a topic of much debate on the trail. Which is the best water filtration system? There is no right answer to that question, but their is a wrong one. The Sawyer Mini… its worthless. Don’t buy it. The larger Sawyer is a good buy, but personally I suggest getting water purification droplets, Aquamira is what I used. Small, light, and simple to use. Fishing gear: Yeah it might be a little extra weight, but live a little why don’t ya! Their are some great, simple, light fishing rigs out their if you are a little creative. Bug Spray: Never forget bug spray. Ever. Light: A headlamp for around camp at night and/or a BioLite Powerlight Mini to eliminate your tent will be crucial for late nights reading, writing in a journal, and reviewing maps. Journal: Bring one. You will be glad you did. Oh yeah, bring a map. You're gonna need it. Save weight in small places. - Do you really need the handle of your tooth brush? Saw it off to a little nub. GPS on your phone: Their are apps like Gaia and Guthook that will allow you to track your location on the trail via GPS. I went with a compass and a topo map, but seeing as the trail was completely covered by snow for many days at a time in 2017 I became very reliant on other hikers with GPS to navigate. Look into it. Snowfields and sunscreen: When walking over a snowfield, put on LOTS of sunscreen; you are basically hiking up a giant mirror. And don’t forget the underside of your nose. Repackaging Food: If the food you are bringing has big, bulky packaging you can save some space by putting it into sandwich bags that you can squeeze the air out of. This will help save space that can be used for more food, the one thing you cannot bring enough of.